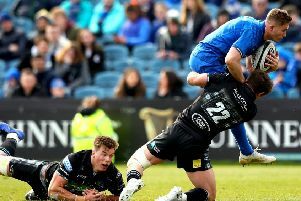 Glasgow Warriors are closing in on a stunning deal to bring former fans’ favourite DTH van der Merwe back to Scotstoun, according to reports. According to the Daily Mail, the two parties have held talks over a return to Scotland for the South Africa-born wing, who is currently with Aviva Premiership side Newcastle Falcons. But Warriors coach Dave Rennie believes the former Saracens player still has a lot to offer and is hopeful of luring van der Merwe back to Glasgow in time for the start of the 2018/19 campaign. The deal on the table is understood to be a two-year contract, which the 31-year-old Canada international is said to be keen to sign. Van der Merwe spent five seasons at Scotstoun, scoring 43 tries in 96 appearances, before joining Scarlets in 2015. He moved to Kingston Park at the start of the 2017 season, but his contract is up in the summer and he could relish the chance to return to Glasgow for a second spell.